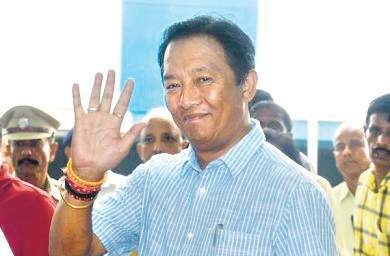 Darjeeling: Rebel Gorkha Janmukti Morcha leaders Binay Tamang and Anit Thapa have started placing their loyalists in important portfolios in the party in an attempt to tighten the lobby's grip, at a time Bimal Gurung and many of his aides are on the run. Sources said the Tamang-Thapa camp had already formed an 11-member core committee, separate from the existing 90-member central committee. "This core committee was formed recently to guide the party. We are also looking at inducting new members," said a party source. On Tuesday, the Tamang lobby had appointed Kamal Chhetri and Zahid Khan as the new president and secretary, respectively, of the Morcha's Darjeeling town committee. The earlier president was Allen Chhetri while the secretary was Bharat Rai, both perceived to close to Gurung. "Kamal Chhetri and Zahid Khan were unanimously nominated. We are trying to bring in new faces but also retain the old-timers so that there is a mix of enthusiasm and experience," said Satish Pokhrel, the newly appointed convener of the Darjeeling sub-divisional committee of the Morcha. D.K. Pradhan, the chief of the Darjeeling municipality, was the president of the sub-divisional committee. But with Pradhan, who is seen as belonging to the Gurung faction, in jail, Pokhrel's appointment as the new convener is also an indication of the Tamang camp's plan to cement its base. "We have also appointed Sushma Rai as the convener of the Nari Morcha's Darjeeling sub-divisional committee," said Pokhrel. Binita Roka, who belongs to the Gurung camp, had recently been appointed the president of the Nari Morcha's sub-divisional committee. The GTA's employee union, Janmukti Astai Karmachari Sangatan, has already shuffled its portfolio members and the new committee has sworn allegiance to the rebel camp. Observers believe that with Gurung on the run and many of his close aides either in jail or having switched loyalties, the rebel camp is trying to weaken the Morcha chief's influence. "Most of the leaders from the Gurung camp are untraceable now, fearing police crackdown. The stage seems just right for Tamang and Thapa to pack the party with their loyalists so that Gurung finds it difficult to mobilise party cadres in the future," said an observer. Rebel Gorkha Janmukti Morcha leaders Binay Tamang and Anit Thapa have started placing their loyalists in important portfolios in the party in an attempt to tighten the lobby's grip, at a time Bimal Gurung and many of his aides are on the run.